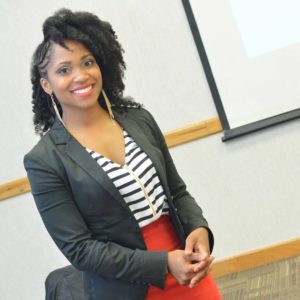 – The Founder of Secret Curl Society, an organization that empowers women through content creation, professional consultation, support services, and educational workshops to benefit women in the areas of personal marketing and true beauty. – CURLS Organic Hair Care, Company Educator, working with partnerships and education of the world renown brand. With a passion to teach, this role is both befitting and stimulating, as Sands readily prepares women and stylists to take textured hair care to higher levels. Janelle Sands began as a stylist, over 20 years ago. As a very young girl, she was gifted a Cabbage Patch Doll called “Pretty Crimp and Curl” from her mother who taught her the basics of hair braiding. This doll named Christian opened a whole new world of hair adventure and in no time, Sands began styling Christian and her grandmother’s collection of dolls; working on their hair, makeup and fashion. After moving to Anchorage, Alaska, her family stylist, a Jamaican woman named Ms. Joyce gave Sands a mannequin doll and taught her many hair styling secrets like how to add hair extension. After much practice, Sands became good enough to travel the city with Ms. Joyce to perform braid services to clients in salons and beyond. Later, other stylists like Tara Wall, Toby Vernay, Joyce Ayers and Katrina Mallard also saw something in Sands that led them to also share many valuable techniques which took Sands natural ability to the professional level. As you know, hair styling is not just about hair, but also about business. Through Kristina Jones, mentor to Sands at a women’s Empowerment organization, the Alliance for Women and Children, taught Sands about management, philanthropy and giving back to others while creating prosperity for organizations and people – women in particular. According to Sands, ” After 20 years, I am so overwhelmed with humility that so many wonderful people have sown greatness into me through their mentorship. It is now time for me to give back.” Secret Curl Society is a way for the common woman to embrace her natural self and enhance her life through image empowerment. Soon to come, Sands will launch her sister initiate “Super Girl Society” to empower growing women in their physical and spiritual health, wealth, relationships, career, and pursuit of happiness.